Lark Mason is the founder of iGavel Inc., an online auction site specializing in the sale of fine and decorative arts. 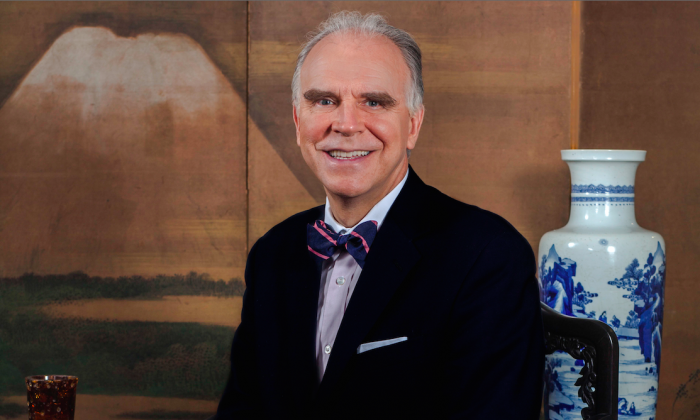 He is known for being a leading expert, appraiser, and television personality on the PBS series “The Antiques Roadshow,” and has served as senior vice president and specialist in Chinese art with Sotheby’s Chinese Works of Art Department. For Asia Week 2014, we asked him about iGavel’s Asian offerings. Q: What initially got you interested in Chinese art? A: I became interested in Chinese art when I first saw the magnificent Song and other ceramics in the Percival David Collection in London in late 1979 and then the Chinese gallery at the British Museum. I was struck by the beauty, timelessness, and fact that I was experiencing this object in the same way as did individuals who lived hundreds of years before me. Q: What are the advantages to the buyer of bidding online? A: Convenience is a great benefit of online auctions and with sales on iGavel, the two-week bidding window is especially helpful. All sales on iGavel are completely online but with “live” exhibitions, enabling bidders to see items first-hand and allowing the bidding process to be fair to all since everyone is bidding on the auction platform, there is no salesroom and thus no salesroom bidding. Q: How do you suggest visitors to iGavel choose pieces to bid on? A: The best items to purchase are those that appeal to them personally. Bid on what you like, and choose items that are the best examples you can afford. Q: Some of the lots have very little information with them. How should a buyer deal with the question of authenticity? And does iGavel offer additional vetting in Chinese art? A: iGavel is an auction platform with sellers who guarantee the accuracy of their statements and the condition report for each item. Some sellers are specialists and more knowledgeable about Chinese art than others, but all items are guaranteed. Objects that are not as described may be returned for a refund. Q: What are some of the most significant items that have passed through iGavel? A: In 2012 Lark Mason Associates sold on the iGavel site a Chinese Imperial Zitan Armchair made for the Qianlong Emperor. It realized just over $1 million. In 2011 we sold paintings by Qi Baishi and Fu Baoshi for over $1 million and over $700,000, respectively, and a large Ming Dynasty huanghuali cabinet for over $500,000. Q: How often does iGavel offer Asian art? A: Asian art appears on iGavel almost daily. Our largest sales are held in the spring and fall and in both instances offer many fine objects ranging from jade to bronzes and paintings. Q: What is the most-asked question you field from potential buyers? And what is your response to that question? A: Most buyers are interested in authenticity. Our sellers have expertise in areas as diverse as jewelry and cameras, American folk art and photographs, and of course Asian art. My background includes 24 years as a senior specialist in Chinese art at Sotheby’s. Most auction houses do not offer guarantees for accuracy or condition. Sellers on the iGavel site do. Auction houses in the past typically relied upon first-hand inspection, as a shift to the internet took place, more individuals have been exposed to auctions and expect that the same guarantees will extend to them. This is an evolving process and we are glad to be leading the way.